Import script creates one GL transaction for each unique ‘reference’ number. There can be any number of lines (rows) in each transaction. Debits and credits must be equal before the CSV file can be imported. Format your journal data according to the layout show below. 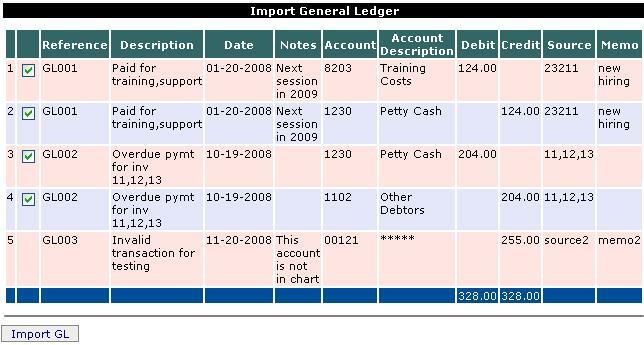 Using ‘Imports–GL Transaction’ load the CSV file into sql-ledger. Import script will show the rows which contain valid account number and can be imported. Click Import GL to finish the import script. Transactions successfully imported will be show on the next page.